My word for 2012 has been trust. I was concerned when God told me that was my word this year. I had a feeling that if I picked trust to study this year I’d have plenty of opportunities to put all I was learning into practice. Boy, was I right! The last 10 months I’ve faced so many obstacles that have led me to trust and rely on God like I never have before. None of those obstacles have been as hard to face as I thought they would be… until now. That night as I sat by the lake I couldn’t think of one thing to write on my stone. Not that life was perfect (it wasn’t) but because my faith in Him was so real, so tangible that it was impossible for me to worry about anything. Which makes no sense what-so-ever after all that He has faithfully guided me through. I mean, it’s just a house! But I’ve become a woman obsessed, worrying myself into a frenzy. I’ve spent every spare moment looking, looking, looking for the perfect house. And y’all it’s driving me batty! I’ve never been a worrier. But here I am stressed out to the max! Last night I finally reached my breaking point. I was so worked up I couldn’t even think straight. So I reached for the only thing that I knew would calm my heart, and read about someone else facing a move. Abram. He and his family lived in Harran. They seemed pretty happy there. But God had different plans. Plans that involved relocation. So Abram packed up his family and headed out; destination unknown. God had a plan but he didn’t fill Abram in on the details. All that Abram knew was that he was to “Go from your county, your people, and your father’s household to the land I will show you.” (Gen. 12:1) I don’t know about you but I think I would have had a few questions for God. But Abram didn’t question God, he just went. It became a pattern in Abram’s life, God would give him the first step and Abram would set out after Him. And every time Abram believed God, God provided for Abram. The last several days I’ve had a song stuck in my head. I find myself singing it at the craziest times. “I want adventure in the great wide somewhere, I want it more than I can tell…” Strange isn’t it? The girl scared to death to move across town is singing about great adventures in the “somewhere”. It’s one thing to sing about adventure, quite another to live one. I think the problem is that we so easily forget. We forget about our shield and great reward. We forget about the One that goes before us. We forget that even though we don’t have an address to type into the GPS of life the One who guides us has this adventure all mapped out. So instead of trusting in the Creator and Guide to get us safely to our destination we worry and stress about the trip. And how crazy is that? I mean if Jesus showed up in a loaded down minivan (although, I’m pretty sure Jesus would pick a much cooler mode of transportation than a minivan) and said “get in” I’d drop everything, change my Facebook status to “Road Trip!” and not look back. After all, I’m pretty sure this life is supposed to be an adventure not an anxiety trip. 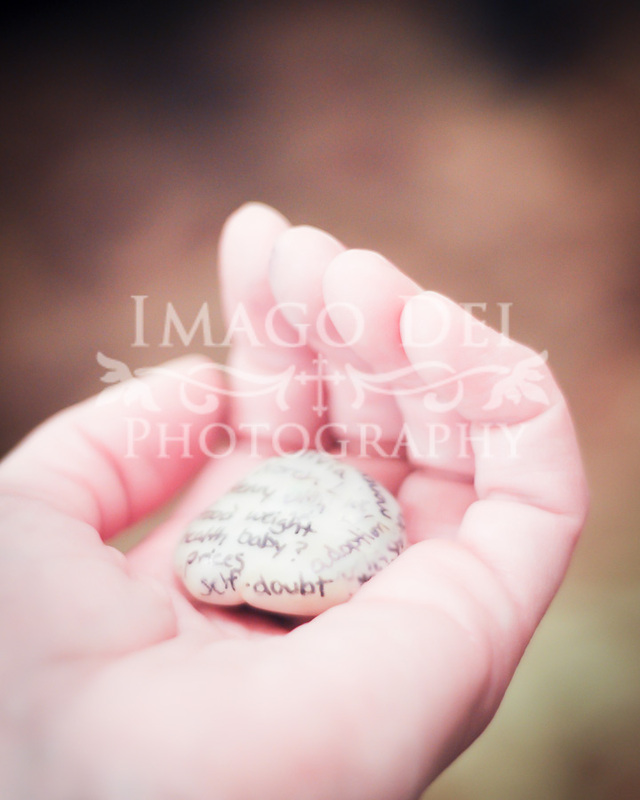 I don’t know what’s written on your worry stone today. Maybe it’s a house, or a job, or healing, or loneliness, or a child. I don’t know what road God is asking you to travel. But I do know this… we don’t walk alone. He goes before us. He is our shield. Maybe it’s time to take a lesson from Abram. I’m gonna believe God. How about you? Love this, Keri! Thanks for writing it.